Click here to LIKE our Facebook page and receive 15% off of your next service! 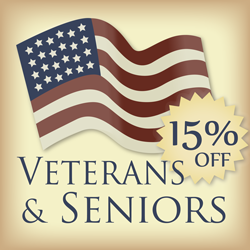 All Veterans and active military personal along with senior citizens are eligible for a 15% discount on all services. Please mention this discount when scheduling your service.